For smaller companies and websites, shared hosting (multiple sites hosted on the same server) is often the most cost-effective and practical option. Each site receives a certain partition on the server when the account is opened, and the cost can be very low – sometimes as little as several dollars a month. Well, as it turns out, several things. First, all the sites on a shared server share the server’s resources – and there’s only so much bandwidth to go around. If one site on the server gets hacked or experiences a sudden spike in traffic, it uses up most or all of the server’s resources, and all the rest of the sites on the server slow down or crash. It’s like a chain: When one link breaks, the whole chain breaks, too. This problem gets worse the more sites you have on the server. Unfortunately, many popular hosting companies like HostGator and GoDaddy cram 200 to 500 sites onto a single server in order to cut down on costs. These servers become increasingly unstable, crash often and need frequent reboots. Even worse, many of these companies provided limited or no tech support. When you’re having problems with your site or server, you’re essentially on your own. They may also back up their data infrequently, or not at all – telling site owners they’re responsible for their own backups. If the server crashes and you’ve lost important information, there might not be a way to get it back. Boom! You just lost all your data. And wasted $5 a month. Before signing up for shared hosting with any provider, make sure you check reviews online and on tech discussion forums. If a hosting provider has problems, disgruntled customers are usually eager to share their grievances online. Do some shopping, do some digging, and check sites like http://www.webhosting-reviews.org/ and http://www.whoishostingthis.com/hosting-reviews/ . You won’t be sorry. And don’t let horror stories scare you away from shared hosting! There are many reliable shared hosting providers that offer faster speeds, good tech support and service, firewalls and frequent backups. If you’re a smaller business who needs a good interim hosting solution, this is usually the best way to go. Just be smart, and choose wisely. Perhaps one of the best things about shared cloud hosting is that it’s a scalable solution. As your business grows, your amount of stored data can grow too. If you’re downsizing, your website can downsize with you. And when you’re ready to upgrade to a dedicated or semi-dedicated server, you always have that option. 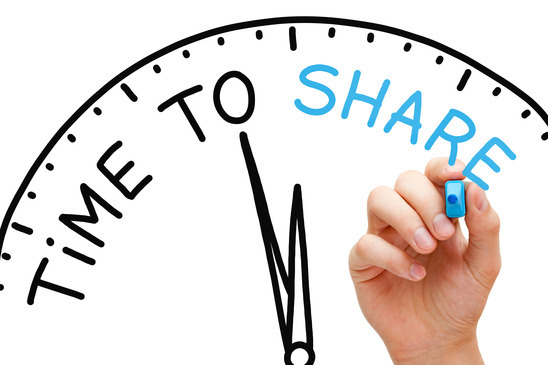 Sometimes, sharing can be a great thing.